Most of the time, Cocoa fulfills the promise: Common things are easy, and uncommon things are possible. If you find yourself writing many lines of code to do something rather ordinary, you are probably on the wrong track. And I don’t think that this is unique to development with Cocoa – a lot of libraries these days promote ease-of-use for the developer. However, it seems that a lot of programmers love to make their lives more difficult, by not thinking about what they’re doing to solve a problem, and go in blind to find something that works – perhaps as trial and error because they are not familiar with the area they are developing for – but which makes more work in the long-run by being harder to maintain. The other day I was browsing the website of European cinema chain Odeon to look up times for a film. 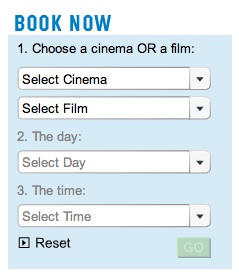 I was appalled to see that the “Book Now” form in the right-hand column of the page was implemented using Flash. Provided a less than adequate visual appearance (at least compared to what would otherwise be there with an HTML form) which doesn’t look like a “native” combo box. Implemented different behaviour than would otherwise be implemented if using an HTML form, thus causing confusion and annoyance. Re-implemented something that could be done easily in HTML, with about 3 times as much effort. The general idea here is that people will often go out of their way to make life harder for themselves, in order to change some functionality of a class that could otherwise be done through interaction with the class in one line of code, simply because they do not know of a simpler way, or do not dedicate a bit of their time to find out a more efficient method. I think that a key skill in any programmer’s life is when you develop a certain intuition for what seems to be right or wrong – you come up with a solution to your problem which looks too verbose or complex for what you’re trying to achieve, and this sets alarm bells ringing. However, before this is the case (and even when you do develop this skill), it’s important to think about what you’re doing; if you are approaching the problem, do some light research into it and ensure that what you are doing is one of the best, most efficient and painless ways to do it. Make sure that what you’re doing is for the right reasons, and not simply doing it to make it work. Agreed, the Odeon website is a train wreck and the gratuitous and pointless use of Flash on the home page adds nothing. Even stranger is that the cinema finder (http://www.odeon.co.uk/fanatic/cinema_finder/) doesn’t use Flash! It feels like different parts of the site were developed by different teams. Yes; even more bizarre is that the Flash form I mentioned above essentially masks a plain HTML form which does the same job. I could believe that very easily!